The Rose Parade will not be the first time on the international stage for Snellville, Ga., native Daryll Victorio, a graduate student studying music education at Western Carolina University who suspects he is the oldest member of the Pride of the Mountains Marching Band to march in the parade on Jan. 1. Victorio, 33, marched in the Macy’s Day Parade in 1994 with a group of high school students from Georgia and performed with the Olympic band that played in 1992 at the announcement of the Olympics to be held in Atlanta and at the Olympics opening and closing ceremonies in 1996. Victorio said he had almost finished his degree in music technology at LaGrange College when he realized he wanted to be a teacher. He decided to pursue his graduate degree at WCU after working at a school for several years and “stumbling upon” the Cullowhee area while whitewater kayaking in the region. The marching band alone has about 80 students who are pursuing some course of study in music education, and marching band directors designed a student leadership program specifically to help prepare students who plan to lead their own band programs someday. “It turned out to be quite a good fit,” said Victorio. 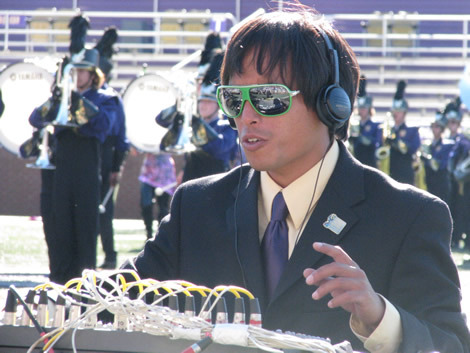 As one of the marching band’s electronics coordinators, Victorio works with the front ensemble, which features vibes, marimbas and auxiliary percussion as well as soloists and small groups on the sideline, such as a woodwind sextet and vocalist. He also helps with the “Soul Train” pre-game show for tailgaters in the fieldhouse parking lot before football games.